Flush Waste & Toxins From Your Body! "Protects Against Cell Damaging Free Radicals"
• Acai Berry Works To Increase Your Metabolism While Providing It With Rich Antioxidants. • Just As Effective As Freeze Dried At Half The Price! • Our Top Grade Acai Berry is Guaranteed 100% Pure. • No Fillers, No Blends, No additives Just 100% Natural Acai Berry. • Only The Berry Skin & Pulp Are Used, No Seeds No Roots. 1. Stay Away From "Free Trials" They can be hard to cancel and typically have very little acai in them. 2. Observe The Label. You want to see at least 1000mg dosage (Usually this is split by two 500mg capsules) if the company won't show you the label ... this is a major red flag. 3. Is It A 1 Month Supply? There are some well known vitamin and herbal companies selling acai products with a 15 day supply. Customers usually think there getting a deal, but half way through the month find out why. Look at the serving size! 30 capsule bottles at 500mg and 60 capsule bottles at 250mg are both falling short of the bar. They do this because it makes the price "appear" to be half as much as other places. 4. Stay Away From Roots. The roots have never been tested for nutritional value. 5. Proprietary Blends. Most Acai products do not work because they do not actually have enough Acai in them. Reason being that they blend it with other ingredients and have names like (proprietary blend) so they don't have to tell you how much Acai is in it. 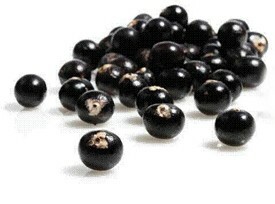 Nature’s Elements provides the best and purest form of Acai Berry. This powerful antioxidant contains a 10:1 concentrate of Acai Berry. A 10:1 concentrate means that out of 100 pounds only 10 pounds of extracted ingredients are used resulting in a higher concentration for the capsules. Only the berry skin and pulp are used, no seeds and roots! 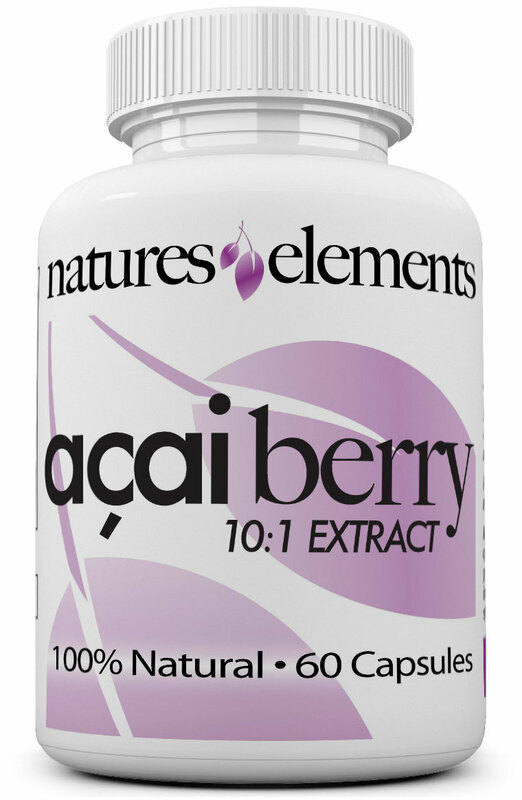 This concentrated form of Acai Berry allows us to put 1000 mg of Acai Berry in each serving. This potency is not commonly found in other products, so don’t be fooled by imitators whose product may contain less milligrams and/or no extract process . Competitors often sell less potent formulas with filler ingredients that are cheap enabling them to put less Acai Berry and keep there costs down. Because our Acai Berry is so concentrated you only need to consume two a day. Discover The Secret Of The Energizing Acai Berry! Acai Berry grows in lush palm trees in the heart of the Amazon Rain forest. Acai Berry is a deep violet color and is the most naturally potent antioxidant around. Acai Berry has been eaten in the rain forests of Brazil for centuries to enhance overall health, energy and vitality and has become a staple of the healthy Brazilian diet. Thanks to its rising popularity it has come to be called “nature's super food,” now you too can enjoy the super antioxidant power of Acai Berry! Our Acai Berry is the most potent formula available. It ensures that you're getting the maximum amount of antioxidants, amino acids, protein and fiber that this magical berry has to offer. Its powerful ingredients are clinically shown to increase your metabolism while providing it with rich antioxidants and at the same time detoxifying the body of harmful free radicals and preventing them from reoccurring. Studies have shown that antioxidants battle against harmful free radicals, lower cholesterol, and helps maintain heart health with Omega 6 and Omega 9 fatty acids. In fact, Our Acai Berry has more than 30 times the antioxidant potency of even the healthiest fruit on earth. That's why we're proud to know that Acai Berry is helping thousands of people around the world stay committed to their healthy living style. Acai Is The Most Powerful Source Of Anthocyanins. Research has shown that Acai is found to contain the most potent and powerful source of anthocyanins (flavonoids) in the world. Acai is also noted for its healthy fat content as well as its fiber and phytosterols to promote a healthier cardiovascular system and digestive tract. In addition, Acai has what is described as a “nearly perfect combination of essential fatty acids (EFAs) as well as important trace minerals which are essential to muscle contraction and muscle regeneration." Free Radicals & Antioxidants - What are Free Radicals? Antioxidants are produced naturally in our bodies and are derived from the food we eat. 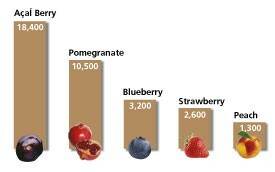 Antioxidants have major significance to your overall health in terms of fighting free radicals. You cannot ignore this very significant issue when it comes to antioxidants and your health. Without sufficient antioxidants, your body becomes a target for many adverse health consequences. Antioxidants are essential to healthy living. Free radicals form in our bodies as we metabolize (process) food and during other natural body functions. Also, they are created from exposure to the sun, pollutants found in the air, eating processed foods, smoking, and much more. They are also caused by stress. When athletes are exercising, they are doing so to gain a health advantage. But, the additional stress they put on their bodies actually creates more free radicals. This seems contradictory but it is a fact. How Can The Antioxidants In Acai Help You? So, how do you get rid of free radicals? You give the free radical the extra electron it so desperately needs. What substance can supply this extra electron? You guessed it - antioxidants. Antioxidants are any substances that prevent or slow the oxidation process. Remember, free radicals cause oxidation - and antioxidants prevent oxidation. Antioxidants work by donating an electron to a free radical so it becomes a stable oxygen molecule. 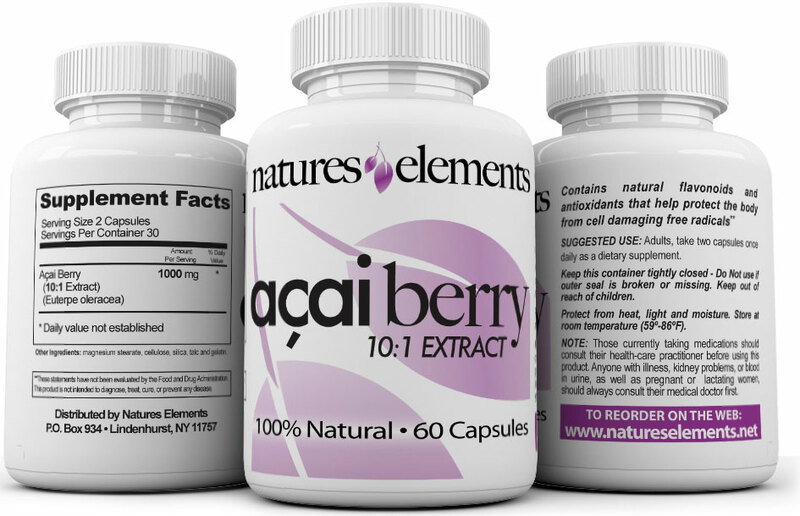 Each serving of Natures Elements Acai Berry provides you with 1900 ORAC. ORAC stands for Oxygen Radical Absorbance Capacity and is the new standard of measurement jointly developed by the National Institutes on Aging and the USDA Human Nutrition Research Center on Aging. In simple terms, ORAC measures how well a food or drink renders free radicals inactive. Since free radicals can damage healthy cells, the higher the ORAC value, the better. More Acai Berry Diet Benefits! The Acai berry is very rich in healthy Omega fats. Nearly half of the Acai berry is comprised of fat - with 74% of the fat coming from healthy unsaturated fats such as Omega 3, Omega 6 and Omega 9. 19 different amino acids have been found in Acai. Since amino acids are the building blocks of protein, it is no surprise that you have over 8 grams of protein in a 100 gram serving of Acai. 3 plant sterols (or photosterols) have been identified in Acai - B-sitosterol, campesterol and sigmasterol. Photosterols have been shown to have numerous health benefits for maintaining healthy heart and digestive function. Vitamins A, B1, B2, B3, C and E are all present in Acai. In fact, Acai contains as much Vitamin C as blueberries and has over 1000 IU of Vitamin A for every 100 grams of Acai. In addition, potassium, calcium, magnesium, copper and zinc are all found in Acai. Anyone with illness, kidney problems, blood in urine, taking medications as well as pregnant or lactating women, should always consult their doctor before use. How Long Should I Take AÇAI? Acai Berry is taken daily with two small easy to swallow capsules. Each bottle of Acai Berry contains a 1-month supply. Although Acai Berry may work quicker from one individual to the next, we recommend you use Acai Berry on a daily basis for the recommended period of time. After consistent use for at least 2-3 months, you should begin to see and feel results. You will achieve continued results the longer you are on the product. Be sure to order an ample supply. Natural supplements are designed to create a holistic balance within the body and can take time to propagate through your system. Be patient stick with it...you’ll be glad you did! Since I have been on it I noticed that I have much more stamina when I exercise.